In policy and rhetoric, the president laid out a strong opening gambit on reducing gun violence. 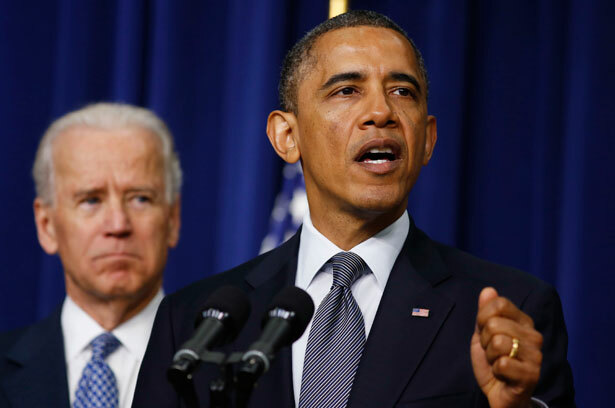 President Obama speaks at the White House alongside Vice President Biden on January 16, 2012, about a new push to control gun violence. Credit: Reuters/Larry Downing. One month and two days after the shootings in Newtown, the White House unveiled a broad strategic plan for reducing gun violence—and unlike too many other moments in his presidency, Obama went big. The policy proposals are ambitious, as was the presidential rhetoric used to ask for them. An assault weapons ban: “Weapons designed for the theater of war have no place in a movie theater,” Obama said, in an obvious reference to the seventy-one people shot in Aurora, Colorado, this summer, while noting that Ronald Reagan also favored such a ban. Obama asked Congress to pass another assault weapons ban—the last one expired in 2004—and to close the loopholes that existed last time. Senator Dianne Feinstein’s legislation is a near-certain vehicle for this proposal. Ban on high-capacity magazines: Obama proposes capping magazine clips at ten bullets, which is also a feature of Feinstein’s bill. Universal background checks: Obama noted that 40 percent of the gun sales in America are conducted “privately,” and thus buyers are not subject to background checks. The White House flags this as the “single most important thing we can do to prevent gun violence.” Obama asked Congress to not only close the gun show loophole but require background checks for all gun sales, with narrow exceptions for transfers between family members and temporary transfers for hunting purposes. Ban armor-piercing bullets: This is something the law enforcement community is strongly behind—police don’t want bullets that can break through their vests being fired at them. Obama wants Congress to ban not only the sale of these bullets, but also ownership and transfer—in other words, a total ban. It’s a good policy idea, but also one that focuses the public debate on some of the truly absurd weapons Americans are allowed to easily obtain. Fund police officers: Obama wants Congress to pass $4 billion to fund police enforcement around the country. This is a slight (very slight) paean to the NRA proposal to put armed officers in every school in America, but also dovetails with the administration’s long-standing pleas for Congress to fund public sector employment in the cash-strapped states. Similarly, Obama wants Congress to fund 1,000 new school counselors and $50 million spent on an anti-bullying initiative. Obama also signed twenty-three executive orders on gun control, beyond what he’s asking Congress for. The highlights include directives to state health programs to make sure there is parity between mental and physical health services under Medicaid; a raft of orders designed to beef up compliance with the FBI’s criminal background check system; and increased law enforcement of existing gun laws. Crucially, Obama will also nominate a permanent head of the Bureau of Alcohol, Tobacco and Firearms, which has been without even a temporary chief since 2006 and without a permanent one since 1970. That will reportedly be Byron Todd Jones, who is already at the agency. I detect a small whiff of impeachment threat from Rubio, something one Republican member of the House has already openly threatened. And Representative Bob Goodlatte, who essentially carries the banner for the NRA in the House, wouldn’t rule it out on C-SPAN this morning. Meanwhile, House Speaker Nancy Pelosi endorsed Obama’s proposal in a statement, and included a crucial and explicit endorsement of the assault weapons ban. Harry Reid, is also waffling on an assault weapons ban, put out a similar statement that said, “I thank the president’s task force for its thoughtful recommendations,” and committed that the Senate would consider legislation soon, but endorsed no particular aspect of the plan—notably not endorsing the assault weapons ban. This is the land of the free, and it always will be. As Americans, we are endowed by our Creator with certain inalienable rights that no man or government can take away from us. But we’ve also long recognized, as our Founders recognized, that with rights come responsibilities. Along with our freedom to live our lives as we will comes an obligation to allow others to do the same. We don’t live in isolation. We live in a society, a government of, and by, and for the people. We are responsible for each other. The right to worship freely and safely, that right was denied to Sikhs in Oak Creek, Wisconsin. The right to assemble peaceably, that right was denied shoppers in Clackamas, Oregon, and moviegoers in Aurora, Colorado. That most fundamental set of rights to life and liberty and the pursuit of happiness—fundamental rights that were denied to college students at Virginia Tech, and high school students at Columbine, and elementary school students in Newtown, and kids on street corners in Chicago on too frequent a basis to tolerate, and all the families who’ve never imagined that they’d lose a loved one to a bullet—those rights are at stake. We’re responsible. When I visited Newtown last month, I spent some private time with many of the families who lost their children that day. And one was the family of Grace McDonald. Grace’s parents are here. Grace was 7 years old when she was struck down—just a gorgeous, caring, joyful little girl. I’m told she loved pink. She loved the beach. She dreamed of becoming a painter. And so just before I left, Chris, her father, gave me one of her paintings, and I hung it in my private study just off the Oval Office. And every time I look at that painting, I think about Grace. And I think about the life that she lived and the life that lay ahead of her, and most of all, I think about how, when it comes to protecting the most vulnerable among us, we must act now—for Grace. For the twenty-five other innocent children and devoted educators who had so much left to give. For the men and women in big cities and small towns who fall victim to senseless violence each and every day. For all the Americans who are counting on us to keep them safe from harm. Let’s do the right thing. Let’s do the right thing for them, and for this country that we love so much. That matched, in my opinion, any other moment in his presidency in terms of powerful and emotional rhetoric. The public is quickly getting behind gun control, according to polls, and how durable that momentum is will hold the real key to the messy gun control debate that lies ahead in Washington. Does this mark the emergence of a bold new Obama? In his latest post, Rick Perlstein criticized “President Groundhog Day” for being afraid of his own shadow when it comes to negotiating with Republicans.